Constructed from heavy duty steel, these commodes are available as fixed or adjustable height versions to suit a wide range of users. Two of the legs have wheels, enabling the commode to be moved easily when not in use. 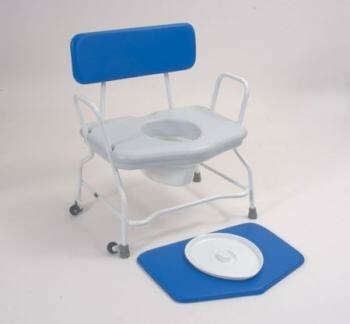 The commode pan loads from the rear. Comfortable padded upholstery is welded to enable easier cleaning. Maximum User Weight: 40 Stone (250kg). Width between arms 735mm (29"). Footprint 800 x 540mm (311/2 x 211/4"). Weight 14.5kg.